I didn’t necessarily release that the company behind the Carn Mor range of single casks, did other stuff. 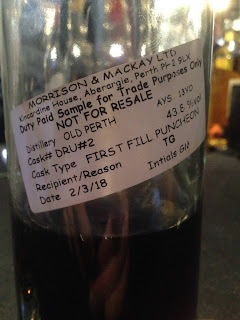 Until I met Peter and Graeme Mackay of Morrison Mackay in Groningen the other day. Fun, whisky fuelled times. Peter, very graciously, was the one to give me a glass of this stuff. Black as night. A single Sherry cask. Highland Park. Macallan. Age statement. What’s not to like? Nose: Lots of sherry of course, but lots of earthy and tobacco notes, very dark chocolate, coffee beans, leather. Seriously earthy after a bit- freshly tilled earth. Taste: Dry and very dark, fig, loads of black cherry, earthy, leather, plenty of oak, deep and thick, orange marmalade, malty peat lurking behind it all. Finish: Medium/Long length. More malty here with more tobacco and black coffee. Distilled 2004, although the ratio of HP to Mac is unknown. Single cask pre-release sample (but it is out now, although you’ll need to be very quick if you want one). Much like the also very dark Bruichladdich from Whiskybroker recently (review coming up), this has zero sweetness. Instead its all about the earthy, dark and dry flavours.